The title of Champion of Champions came back to Gouyave for the second year running when skipper Ted Richards with his talented crew from Classic, sailing GSF16 Tomorrow’s Worries, once again stormed through the finish line well ahead of the rest of the fleet in the 2018 Match Race Final. The winners took away a cheque for US$1,000 sponsored by Republic Bank, plus a Yamaha outboard engine for boat owner Barry Alexis, presented by McIntyre Brothers. This completed a ‘Hat-Trick’ of wins in the major match race finals, with Gouyave crews taking 1st place in both the Budget Marine Junior National Team Sailing Final and the Senior Team Sailing Final, sponsored by Carib. Sailing action took centre stage on Grand Anse Beach on Saturday and Sunday 3 & 4 February as the 25th annual Grenada Sailing Festival White Jack Workboat Regatta took place, bringing high adrenalin racing and fun feting to the crowds who came to enjoy this unique sailing experience – both local supporters and overseas visitors. The fleet of 23 boats from Gouyave, Grand Mal, Sauteurs, Mayreau and Woburn lined Grand Anse Beach, bringing their well-known and much-loved colour to its shores again. The organisers were delighted to report a first for the event – the entry of an all-girl crew, with skipper Kera Messiah, sailing BLAST. Once again for 2018, more new boats had been built for Woburn, making up a record entry of 12 boats in the 2 racing classes of Woburn Traditional and Woburn Sport. The racing was as close and competitive as ever in the Community Classes, with every skipper and crew sailing hard to take first place and the chance to go through to race in the Westerhall White Jack Champion of Champions Match Race Final. At the end of the first day positions were close, leaving everything to race for on Sunday. Once the crowd had enjoyed the excitement of the last race of the day on Saturday, they moved into Camerhogne Park and enjoyed great music with live performances from D Unit Band, with A#keem, Dennison ‘Lion Paw’ and Tamara Songbird St Barnard — some of Grenada’s most talented and popular musicians. These performers will be on stage again at the Pure Grenada Music Festival taking place from 13 to 15 April. After another two races in The Community Class Series on Sunday morning the scene was set for an afternoon of Match Race Finals. The excitement levels moved to a new high as the growing crowds on Grand Anse Beach waited for the boats and teams to be picked for the Budget Marine and Carib National Team Sailing Match Races using the fleet of GSF16s, the 16’ matched design workboats owned by the Grenada Sailing Festival. The racing was as tough as ever and in the Budget Marine Junior Final, Team Gouyave, sailing in Mr X, came through at the finish line to take first in front of Woburn in Pink Gin. The crowds were treated to more high-octane racing in the Senior National Team Sailing Final sponsored by Carib, with Team Gouyave and Mr X once again crossing the finish line first in front of Woburn in Pink Gin with Sauteurs sailing Gybe Talk in third place. In another first for 2018, the winning crews in both races took away a sail donated by Horizon Yacht Charters. The afternoon ended when the winning skippers and crews from the Community Class Race Series battled it out in the Champion of Champions Final. As the sun went down, crowds lined the water’s edge to watch the 5 crews race for the Big Prize. 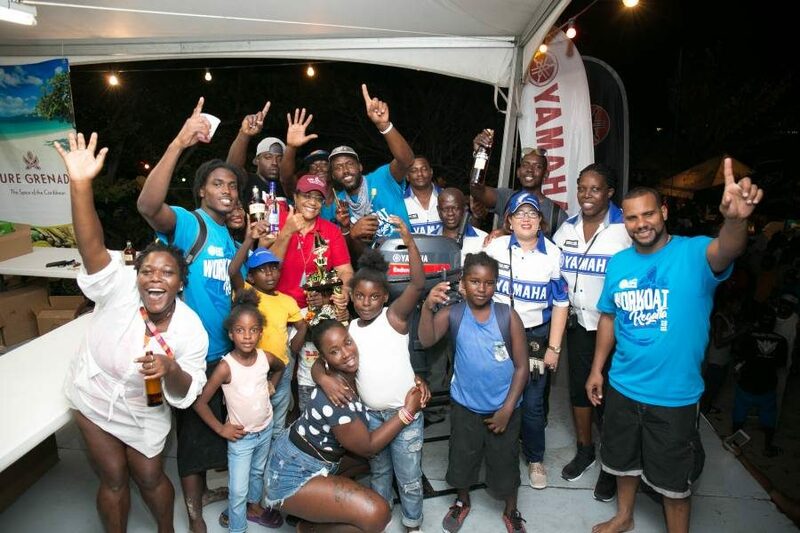 The crew from Classic, the winner of the Gouyave Sloop Community Class, sailing the GSF16 Tomorrow’s Worries, came home in style to take the title, trophy, US$1,000 and the prestige prize of a Yamaha outboard engine donated by McIntyre Brothers. There was great action on the beach as well, with Festival favourite DJ Blackstorm keeping the atmosphere to ‘D’Max’. Crowds also enjoyed all the best traditional dishes from Oil Down to Lobster at Community Kitchen food stalls throughout both days. The Environment Division of the Ministry of Agriculture and consultants GIZ once again had a great display of information about the range of projects being undertaken in Grenada. The Grenada Sailing Festival Westerhall White Jack Workboat Regatta was staged on Saturday & Sunday 3–4 February on Grand Anse Beach and Camerhogne Park. Grenada Sailing Festival wishes to thank sponsors, supporters and festival friends who make the event possible. Third: Sauteurs, with a crew from Swift (Grand Mal boat winner of Sauteurs Class). Skipper Rondel Fergusson winning US$250. It is the second year in a row that Classic and her skipper and crew have won, making them ‘Back-To-Back’ Champions. They will be looking to make it a Hat Trick in 2019.